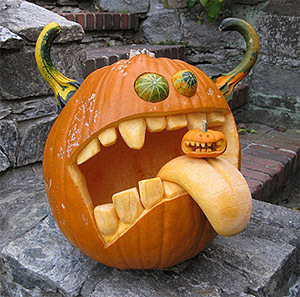 Mindful Design Consulting Newsletter (October 2010) Bring The Fun With Halloween Decor! Welcome to our October 2010 design newsletter! Happy Halloween! As your architectural designer I always try to provide unique decorating and design tips for your business and home. This month it is time to show you my favorite Halloween decorating ideas! These can be done on your house or even on your business building. Please enjoy! Don’t forget to post your reply to this newsletter on my Blog. As you all know I am a big fan of solar powered useful gadgets. 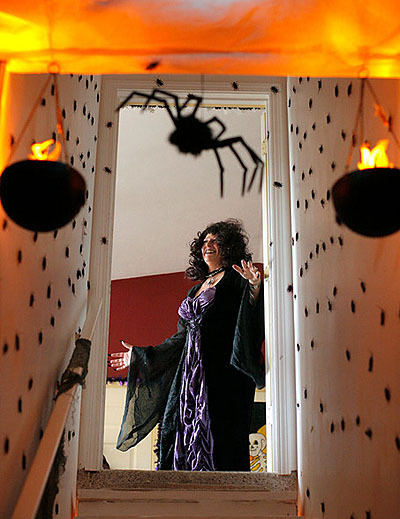 In our Green News corner, I will show you how to use solar lights to power up your Halloween decor. I think this is one of the most beneficial and functional uses for solar powered lights these days. 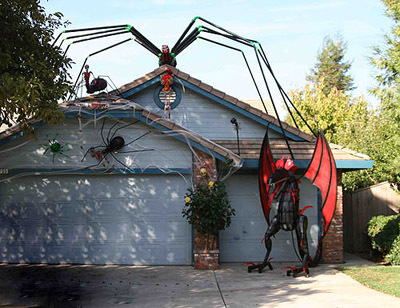 Have you ever considered decorating your home for Halloween? On this controversial Holiday it is a great opportunity to go crazy and bring some joy and fun to your neighborhood! It doesn't matter if it's your home or your business location, on this holiday any outrageous idea can be forgiven! Halloween doesn't have to be full of scary wickedness surrounded by witches and demons. It can be decorated with simple items made out of paper, small string lighting and all of this can actually be in style. Take a look at some of my favorite items to decorate your home or office with. What is HOT to Decorate With This Season? 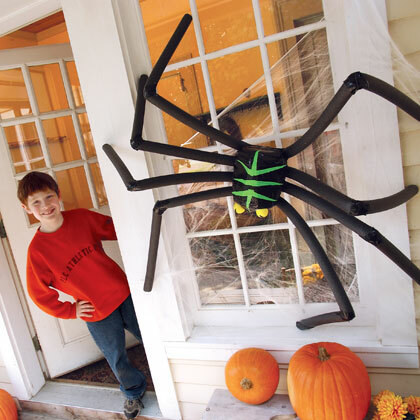 Make your yard (or the front of your business) a joy for the trick or treaters to walk up to, with some lighted Pumpkins, solar lit sticks or maybe a giant spider hanging from your roof. The most important is not to go over the board with too many items. It is also wise to look at the style, size and color of your house to make it look good. Good contrast between the small size of a house on the image below makes it look good with the giant sized, bright spiders and a dragon, if you've got one! Think about some type of a contrast which visually will shock people. One apparent question about Halloween is, what does the word itself mean? Here is what I was able to find out… The name is actually a shortened version of "All Hallows' Even," the eve of All Hallows' Day. "Hallow" is an Old English word for "holy person," and All Hallows' Day is simply another name for All Saints' Day, the day Catholics commemorate all the saints. At some point, people began referring to All Hallows' Even as "Hallowe'en" and then simply "Halloween." 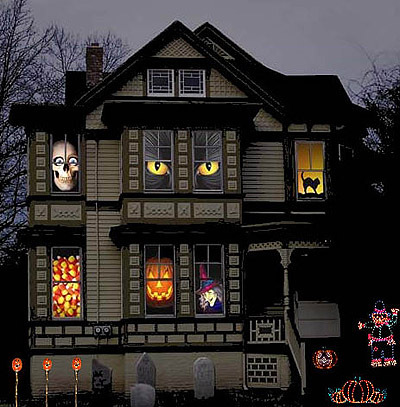 Images applied onto windows with a light behind them is one of the simplest and fastest solutions to decorate your house or business this Halloween. What can we do inside this holiday to follow up our very creative outdoor decor? I have a few ideas for your interior decoration as well. Use lots of bugs in small spaces! And again, large spiders are always welcome to hang around your corners. So what can you do if you don't have your own spyders hanging around the house on time? You can simply make one! If you like what you see on the window below, just follow the instructions HERE to make one. 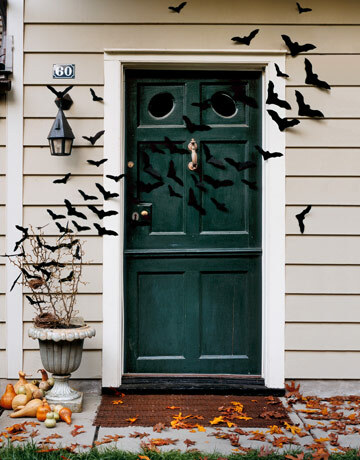 Make it simple when decorating for Halloween. A few pumpkins, black bats cut out from paper and a dried our plant (which you may already have on your backyard :) will do the job as you can see on this image. It is fun and easy to create Halloween settings with Solar String Lights! Wrap them around some tree branches and hang them around your doorway. 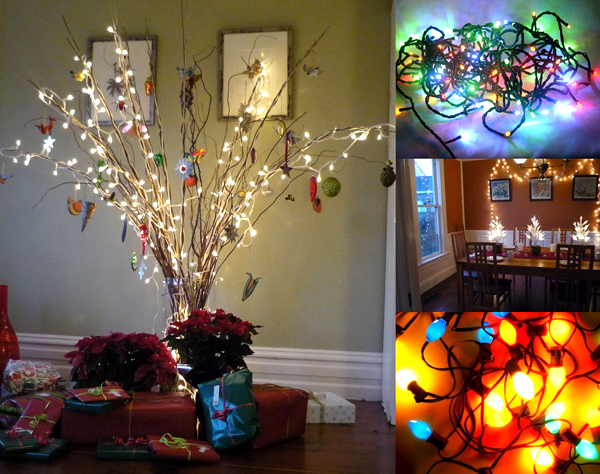 Find some creepy branches at the park (maybe carve your own branches out of cardboard or create your papier-mâché masterpiece), spray paint them with black and orange paints, wrap white or color solar string lights around them for a nice effect at night. Read more on decorating with Solar Lights HERE.